Mindfulness-based meditation has been in the news a lot over the past year or two. Studies around the globe has shown it can reduce blood pressure, alleviate some of the effects of anxiety, depression, and post-traumatic stress disorder. Other studies have shown it likely improves decision-making, migraines and more. However, it was a study in Quebec that got my attention and made me more interested in learning about this ‘miracle’ form of meditation. The study was conducted by the University of Montreal and its affiliated CHU Sainte-Justine Children’s Hospital. That study gives hope to improve the lives of teen-agers with cancer through mindfulness techniques up to and including helping with their recovery. To learn more about the amazing benefits of mindfulness, I elicited help from Randy Gilana Goff. Randy teaches mindfulness meditation in the Los Angeles area. Following is an interview I conducted with Randy which opened my eyes about what makes mindfulness different from other forms of meditation. Randy: Mindfulness is the western word that people have attached to the practice of awareness. It comes from Buddhist practice, although all religions seem to have some type of practice involved where they are encouraged to be more mindful. At the very basic level, it’s the process of being aware of what’s happening in this moment, rather than going to the past or future. Jon Kabat-Zinn, who created Mindfulness-based stress reduction (MBSR), defines mindfulness as “moment-to-moment, non-judgmental awareness.” This is helpful because the smallest triggers occur – physical, emotional or mental and suddenly you’re reliving something that happened to you years and years ago. Or, you project and worry and become anxious about the future. So, the “mindfulness” the western world is working with right now is the practice of scanning your body, meditating and doing yoga with the goal of preventing your mind from dwelling in the past or the future and concentrating squarely on what is happening right now. Bradley: It seems like we are hearing more and more about mindfulness meditation. Why do you think mindfulness is so popular today? Randy: There’s two reasons. Jon Kabat Zinn’s MBSR has become very popular. He has taken people who have never meditated before and given them an eight week procedure on how to become more mindful. To see what their stress is. What their anxiety is. And it’s worked. People are slowing down, they are noticing what they are really feeling and thinking. Some are even changing because they see more clearly what they have been doing to themselves in terms of stress. Then again, we’re always encouraged to look back to our past and to make correlations. There’s even a saying, “If you don’t learn from the past you’re bound to repeat it.” That’s true to a certain extent, learning from our mistakes is intelligent, but it’s been shown recently, that we actually learn much more from our successes rather than our failures. And when you’re thinking about your failures a lot, you’re bound to repeat those failures. So, the saying has to be revised. So, why do I think mindfulness is so important, or that it has caught on so much? I think we need it as a culture to survive. Bradley: How long would someone need to practice mindfulness before they can see the benefits? Randy: A minute – maybe less. As soon as you acknowledge what is going on in you – right now- while you are in the process, there is immediate benefit. Now, if you want long term benefit, which is a stasis of feeling like “things are really okay”, then you need to practice for a longer amount of time and to incorporate Insight. It’s just like exercise, once your body and your mind (which the Buddhists understand to really be two parts of the same thing – they call it “the body/mind”) understands that you are serious about this – that you truly are acknowledging what is going on with you, your body/mind begin to relax. Alarms don’t go off so often; the body/mind knows that consciousness is “driving the bus.” And – this might be a new thought – relaxation promotes healing. Bradley: I find with silent meditation that once I open my mouth I’m not mindful at all. What can I do to change that? Randy: In silence, you have obviously practiced long enough to settle into a silent and peaceful state. A contented state. And the word “contented” is actually the key to this, because the minute the brain regains control of your awareness, contentment goes out the window. The mind is a fantastic machine to analyze and to make suggestions on what could be better. And the minute you start seeing that things could be better than they are right this moment, discontent comes in and mindfulness stops. So, to address your question, what can I do? You might find it interesting, but I would say to place your attention on contentment, because then you are not giving the mind more to do than is absolutely necessary. Bradley: How easy is it to learn mindfulness? Randy: It’s so easy. It’s easy to learn, but there is a big caveat – sticking with practice of it is the hard part. Upset, worry, anger, indecision, anxiety, sadness, panic fear – or even “positive emotions” of love, passion, joy, excitement, anticipation, etc. and we quickly time travel to the past or to future, and we quickly move from mindfulness to mindlessness to discontent. And so, sticking with it is the difficult part. I have one more thing to say about mindfulness. It is fantastic for relieving stress, treating heart disease, lowering blood pressure reducing chronic pain including sleep problems and I’d add to this list – enjoying life. Because life passes us by – we all know this – life passes us by and we never really remember what the heck we did yesterday. You’ll know you’re really practicing mindfulness when you remember the things and people you saw, the same way you remember the smells, the tastes, the lighting, and the people who were around you when you were in a car accident. 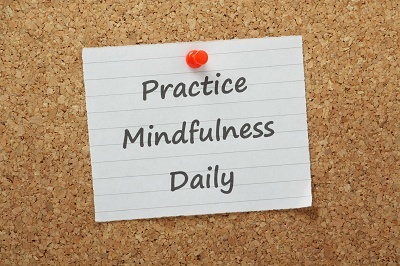 That’s what mindfulness practice is for – to encourage people to have a full life, and to live that way almost every day of their lives – so it’s very, very positive. Lucky people who practice Mindfulness can even go a step further – by changing those behaviors and habits that always bring them unhappiness. That’s the next step in meditative practice – it’s called Insight. But as a first step, increased awareness can bring so much fullness to your life. Thanks for sharing this with us, Bradley 🙂 It’s a treasure that, without you, many of us wouldn’t be able to acquire! i would have liked to reblog this, but you do not have a ‘reblog’ button anywhere on your page. this is a great post explaining mindfulness and the steps of growth and grounding, etc, so that is why i wish i could have reblogged this! Hi kat. I would love for you to be able to reblog also. I’m told you can’t because I self host rather than have WordPress as my host. That doesn’t seem right so I’ll have to do a little research. I guess the only other way us via a link or cut/paste, neither of which are really very good options. I’ll keep you posted. ya i just did the copypasta thing.